The 1980s were not our most subtle decade. Big budget action movies reigned at the box office. The only thing louder than the music was the fashion. It was the heyday of monster trucks, professional wrestling, and laugh-track sitcoms. And the hair was big. 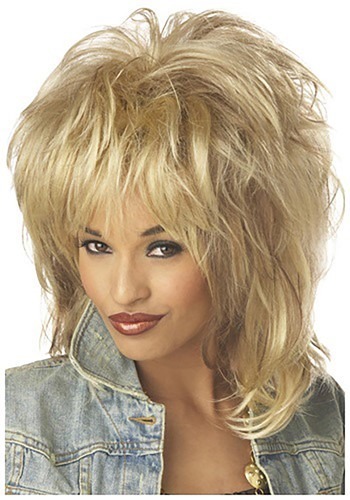 Sure, other eras had their big hairdos - Afros and beehives spring to mind - but in the 1980s hair exploded into a blizzard of feathering, mousse, perms, jheri curls, mullets, teasing, spiking, and poofing. If you didn’t wear your hair big, why even have hair at all? These days the hairstyles tend to be more down to Earth, literally and figuratively, but if you’re aching for a throwback to the glory days of giant hair, look no further than this big blonde wig. Crafted with synthetic fibers and a mesh net interior, this highly teased head of hair is a vision in blonde, with subtle brown highlight streaks throughout. You might recognize it as the signature style of an ageless queen of R&B music, but its appeal is universal. In your heart you know the ‘80s aren’t coming back anytime soon, but there’s no reason your head has to accept that. When I took the wig out of the package a clump of hair came out. It is half brown and blonde, which doesn't look like the picture. It's very shiny and poor quality.